President Obama dispatched the FEMA administrator to Alabama where at least 131 have been killed in deadly storms. 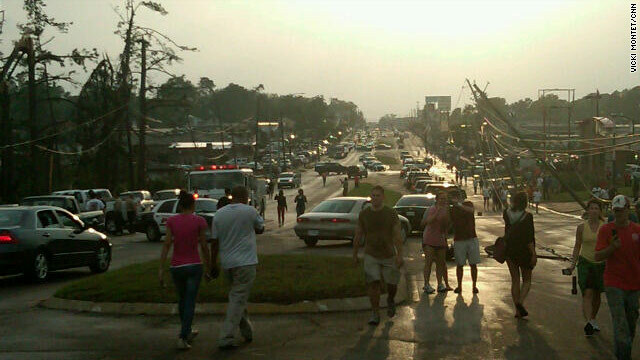 Tuscaloosa, AL suffered major destruction. WASHINGTON (CNN) Federal emergency management officials including FEMA administrator Craig Fugate will travel Thursday toAlabama, one of the most severely hit areas, after a series of devastating tornadoes killed more than 200 people in six states this week. More than two thousand National Guard troops are already on the ground assistingAlabamafirst responders in the search and rescue effort. President Barack Obama Wednesday night declared a state of emergency inAlabamaafter tornadoes there killed at least 131 people. The president and Homeland Security Secretary Janet Napolitano called Alabama Governor Robert Bentley Wednesday night and the president issued this statement, "[I] told him that I have ordered the Federal Government to move quickly in our response and informed him that I approved his request for emergency Federal assistance, including search and rescue assets. While we may not know the extent of the damage for days, we will continue to monitor these severe storms across the country and stand ready to continue to help the people ofAlabamaand all citizens affected by these storms." Thursday in a conference call with reporters, Governor Bentley said the immediate focus is on search and rescue efforts and the National Guard is working with his state's first responders "using all available ground and air assets" to search for survivors. The governor said he is certain the death toll, currently at 131, will rise since so many people are still missing. He insisted the high death toll and the massive destruction especially in theTuscaloosaarea was not due to unpreparedness or people ignoring weather warnings. "(W)hen it hits a largely populated area likeTuscaloosayou just cannot move thousands of people in minutes." The governor said the tornadoes were severe and could end up being categorized as F-4 or F-5 on the National Weather Services Fujita scale which means winds could have reached up to 300 miles an hour. Up to a million people are without power in that state. Thursday, the governor will ask the president to declare an "expedited major disaster request" to allow even more federal resources to be deployed. The tornadoes are just the latest in a series of natural disasters FEMA is confronting, including fires inTexas, tornados in multiple states and flooding. But FEMA administrator Fugate said the agency is prepared to respond. "(We) do have to be prepared for concurrent multiple disasters occurring in this country," he said. The families who've lost have my deepest sympathy and prayers. However, I hope this is a wake-up call to us all. We need to be careful with what we ask for, because we may just get it! We do need to cut spending, but FEMA? That's exactly who ALABAMA, MISSISSIPPI, and GEORGIA's calling on now for help. TEXAS needs help. They're the main ones threatening to secede from the nation! They all claim to want smaller government and they hate OBAMA. 'Vengance is mine saith the LORD'. Thank God for Big Government! I agree with you Liz. We should not cut FEMA. This is exactly where our Federal dollars need to be spent, to help communities rebound after disasters. I also agree that our deepest sympathy and prayers are with these families. Oooooh.....! Really Jay? Well, all I can say is that's 'one for the road'! Never saw that one coming! Thanks Jay!